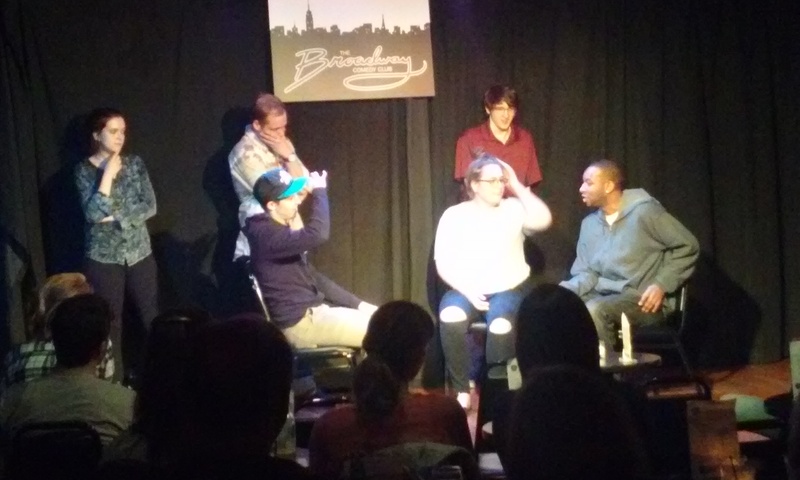 Have you ever been to an improv comedy show? The performers use a few chairs and an empty stage, combined with recommendations from the audience to create believable, entertaining scenes. In just a moment they can take the crowd to a bistro in Paris, a butcher shop in Brooklyn, or a honky tonk in Nashville. The art of improv is a combination of acceptance of an offer, the ability to tell a story, strong listening skills, knowing when to end a scene and being a team player. In business, we use improv everyday, but we don’t realize we do. Here are five examples of how improv skills are like business skills. 1. Acceptance of an offer, or “Yes, and.” The golden rule of improv is called, “Yes, and.” In order to keep a scene believable and moving forward, we must accept the offers our co-performers and the audience give us. If an actor is performing a scene and gives his partner an (invisible) apple and says, “Here is the apple you ordered, ma’am,” the audience would believe that the object she was now holding was an apple. However, if she replied, “No, that’s not an apple,” it would confuse the audience (and frustrate the other actor). Instead, improv actors always use the “Yes, and” rule. Now, picture the same scene, but instead the second actor replies “Yes, and … I am going to use the seeds to grow an apple orchard.” The scene moves forward and you have won your audience’s attention. 2. The ability to tell a story. We are all storytellers, only some of us are better at it than others. You have to know your brand’s story. What is the story of your products and services? How were they created? Why? Who created them? These all make your business human and the stories resonate with your customers. In improv, the story is crucial. Without an interesting and entertaining story, you’re scene is dead in the water. Your audience will get bored and run to the exit. 3. Strong listening skills. You can bet that the best sales people are incredible listeners. They ask the right questions and carefully focus on what their customers and potential customers say. The best sales people are the ones who listen and provide the “Yes, and” when they reply. Here’s how I recommend you listen better. In performing improv, you listen to your fellow performers and look for opportunities to bring twists, turns and laughs into your scene. You also listen to determine when it’s time to throw in the towel and call it quits. 4. Knowing when to end a scene. Not all businesses flourish; in fact, most don’t succeed. You need to be focused on your goals and determine what is and is not working. In improv, the audience can sense the awkwardness of the performers when a scene needs to conclude. Great improv actors can improvise the ending that fits the scene perfectly. Lights dark, curtain down. 5. Being a team player. Smart companies ensure they hire the right people. Hiring goes beyond talents and experience, it’s also about culture. Will this candidate work well with my team? Your improv troupe becomes a family. If you aren’t working well with your team members, the audience will see it and your performance will fail. This entry was posted in Learn to Improvise. Bookmark the permalink.